Ramadan Food Parcels delivered! – Pearl Of The Islands Foundation Inc.
Home > Events > Ramadan Food Parcels delivered! New Zealand has recently welcomed a group of refugees from many countries, including war-torn Syria. The Pearl of the Islands Foundation (PIF) last night visited the newcomers at the Mangere Refugee Resettlement Centre, Auckland for a good cause. In alignment with this year’s annual humanitarian campaign, our volunteers prepared food parcels to be distributed to the underprivileged and refugees who have recently arrived to New Zealand. Parcels include everyday essentials including sugar, oil, rice, pasta, cereal, and other crucial items. 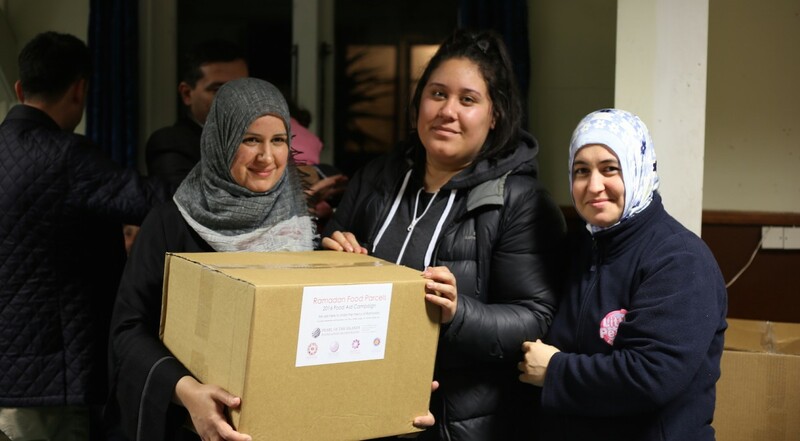 The first 50 food parcels prepared were delivered to the refugees currently awaiting resettlement in Mangere last night. Refugees came from mainly Syria but also included people from Zimbabwe, Colombia, and Iraq. PIF CEO, directors, fellow members, and other volunteers took part in distributing the aid to the large crowd that were waiting for our arrival in one of the meeting rooms. Amongst food parcels, volunteers conveniently offered cake and drinks to the children once the parcels all met their intended recipients. In a heart warming atmosphere PIF volunteers also brought clothing and shoes to donate to the families. It was even more touching when volunteer children were observed exchanging shoes with the Syrian guests. The emphatic refugees thanked our volunteers for their generosity. They will be flying out to Dunedin today to begin their new life in New Zealand. As PIF members, we are trying to make a positive difference through our actions. We have recognised that the relief of poverty is so important that even helping a relatively small number of people can be considered to be help to many. Our goal is to bring individuals together for communities in need. We are glad that our first batch has been successfully delivered. We aim to prepare 150 more but require funding to continue the humanitarian efforts. Each parcel costs NZD $40. Please provide assistance that will bring us closer to our goal. Donations can be direct credited to our account referencing your name and including food parcel in the particulars. PIF is a non-profit and NGO and your contribution is deductible with a 33% donation tax credit.